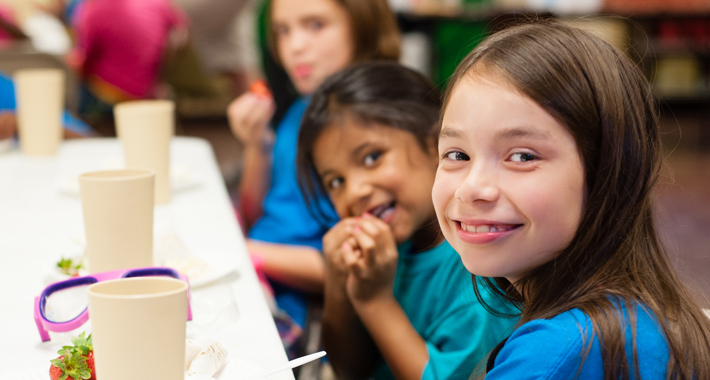 Indiana Afterschool Network wants to highlight your successes around the state. When families, communities and schools work together, students are more successful and the entire community benefits. This sharing and maximizing of resources help children and youth develop healthy behaviors and promote healthy families. As a 21st CCLC Grantee, Blue River Services, Inc. has worked hard to establish support for its afterschool programs and to develop community partnerships that will contribute to the academic success of program participants. All of the effort paid off recently as 21st CCLC Grantees from Blue River Services, Inc. (Harrison County), East Washington School Corporation (Washington County), and Medora Community School Corporation (Jackson County), partnered to host a Color Walk for Children and Families event designed to provide program participants and their families with not only a day of enjoyment but also to connect families with community resources and other supports. The event was held at Buffalo Trace Park in Palmyra, Indiana on Saturday, May 12th, 2018. This tremendously fun event was a great example of families, community partners and schools coming together with a common focus– helping children grow and thrive. On January 28, 2015 Bright House Networks will recognize the 2014 Lights On Afterschool photo contest winner – Carmel Clay Parks & Recreation’s Forest Dale Extended School Enrichment (ESE) with $2000 award. Forest Dale ESE plans to make immediate program improvements by utilizing the $2000 for technology implementation to assist students with daily homework during after-school. Be the next program highlight by submitting your story. The fifth graders at Monroe County Community School Corporation are building a city using the popular computer game, SimCity. A curriculum based off of this computer game was developed by a staff member. Students formed committees and are responsible for creating a well-functioning and profitable city. Each committee (finance, parks and recreation, transportation, etc.) presents a recommendation to improve their city to the group. All students debate the proposed change and come to a consensus. They discussed everything from clean energy, to the placement of a recycling center and how to save money. All student-lead, they were able to make decisions about their city and instantly see the pros and cons of their decisions. This is an on-going project that engages students in real-life experiences that are relevant and important to their lives. Our Yearbook Club is an educational and career oriented program that awakens members to possibilities in a multitude of careers and duties within careers. This program also taps into a few of our other core areas of programming, including The Arts, Character & Leadership, and Health & Life Skills. Our members met for one hour each week to create a Boys & Girls Club of Tipton County Yearbook that featured every major program that our Club implemented during our 2013-2014 afterschool program. We believe we run a lot of great programs at our Club, and we wanted our members to have something that they could keep forever to help them remember their great year at our Club. Having physical proof of their great experience in our Club made it easier for our members to share with their family and friends why they should also join our Club. In addition to that, our Board of Directors runs an annual Business Sponsorship Plan and we thought that if they could show a potential Business Sponsor all that we do at our Club, they might be more likely to support our mission. Our Yearbook Club program was completed online, using a no-cost, no-commitment website. Members were given roles and responsibilities such as editor, publisher, and reporter. Members were assigned specific programs to feature in the yearbook. They spent time collecting information, doing interviews, and taking photographs and video clips for their assigned program. Each member spent time editing and publishing their entry to the website. Our members were given the opportunity to work with laptop computers, iPads, and digital cameras to complete the yearbook. The title of our yearbook for 2013-2014 was “Club Gone Wild”, and was done in an animal theme. Our Yearbook Club took time to discuss how each major program and its participants shared characteristics with animals, and they used these parallels to assign an animal to each major program. In addition to each major program being featured, our Yearbook Club spent time covering special events with our Club when the opportunity presented itself. On Friday, March 13th we will be receiving a state-wide award for Outstanding Program of the Year. MCAS Safe Harbor hosted a site tour and reception for local, state and federal leaders for our 2017 Lights On Afterschool event. 1. Safe Harbor’s Junior Master Gardener students making salsa using peppers and tomatoes from the Southwest garden which Safe Harbor JMG students developed and maintain. 2. Literacy Through the Arts- A cross content curriculum developed in partnership with Michigan City’s Lubeznik Center for the Arts. 4. Safe Harbor’s FIRST Robotics Challenge team running coding enrichment with Safe Harbor’s elementary students. The site tour ended in the school’s Asian garden (which Safe Harbor also developed and maintains) where local, state, and federal leaders came together for a small reception to celebrate the partnerships and collaboration which make the Safe Harbor Afterschool Enrichment Program a success. Safe Harbor’s Lights On Afterschool Celebration was sponsored by Global Engineering and Land Surveying. Since opening our doors in 2013, The Brandon Foundation has shown many students the power of their potential and has gained the support of many surrounding businesses, organizations, and families. For the month of March 2016, the students at The Brandon Foundation were given a big, new challenge: to start their own businesses and run them profitably. At the end of the challenge, 1 student with the most profits would win a BIG check for $175, on top of whatever profit they would make during the month. Students chose to sell either a product or service. The names of each student’s business are below. Once students decided on what to sell, their mentors helped them to create a business plan, which detailed the price of the product or service, the cost of materials needed and a target market to sell to. After business plans were finalized, students developed a marketing plan and designed business cards. Miss Caty gave each student a $20 startup loan to purchase supplies, which was later repaid from each business’ profits. Finally, they could start production and marketing! Lessons at the foundation for the month of March focused on the ins and outs of running a business and how other young entrepreneurs have been successful. Some very young business owners have already made millions of dollars because of their innovative ideas and hard work. Tom Harris, Fort Wayne city councilman and business coach, came to speak with the students as well about maximizing their profits. In short, the students learned that age should never stop them from pursuing their dream of running a business! AB: Where did the inspiration for your business idea come from? EM: I saw a magazine article about how to do cleaning and be more organized. AB: What has been the most difficult part about running a business for you? EM: The hardest part was trying to accomplish new cleaning and decorating tasks for the first time. AB: What was the most important thing that you learned from the challenge? EM: Even though I’m only 10 years old, I can still do anything that I want to, even though I’m little. AB: How excited were you to find out that you won the challenge?! EM: I was really happy, but I didn’t want to make a big deal about it because I knew the other students wanted to win, even though they were happy for me. AB: What do you plan to do with your profits and the money that you won? EM: I already put $100 in my college fund, and the rest is for me. AB: Do you plan to continue your business? AB: Is there anything that you want to change about the business going forward? EM: I would change calling more people ahead of time to get more clients. AB: Do you see yourself owning other businesses in the future, for your career? EM: Probably not for my career, but I would for extra spending money, like for the summer. AB: So, do you know what might want to do for a career. EM: I want to be a famous track player. AB: Is there anything else that you’d like to say about your experience during the business challenge? EM: It was really fun! It was never about the money for me. Even though we had to do it, it was just something fun for me to do!